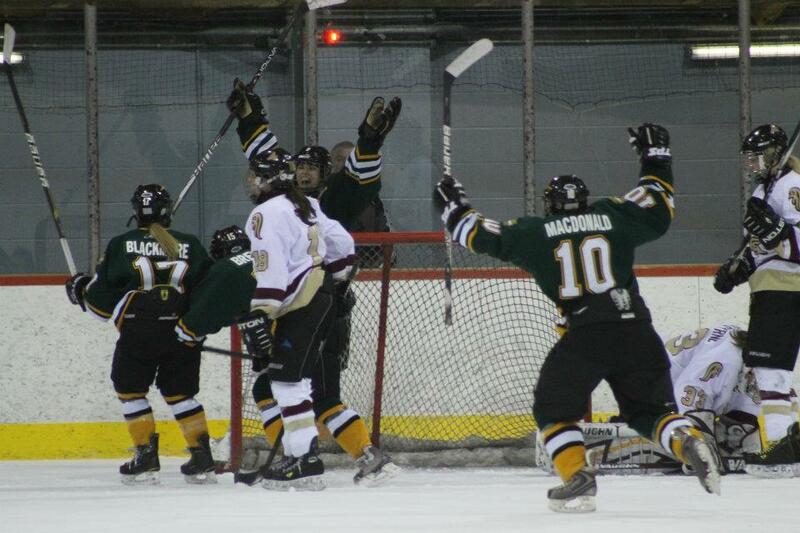 Paige MacDonald celebrate the OT winner. The St. Thomas Tommies finished their 2011-12 hockey season just as it started, with a 2 to 1 overtime victory over the Mount Allison Mounties. Back on October 15th Renata Mastna finished off Mt. A, tonight it was Courtney Fox with the OT winner. After last nights defeat to Moncton, the Tommies really needed to win by several goals to have any hope of advancing to Sunday's final. A well rested Mounties team had different plans. Mt. A out shot STU 15 to 3 in the first period, as Julia Sharun was called upon time after time to keep STU in the game. The past two games that St. Thomas has played have been at the Dalhousie Memorial Arena and both have seen the Tommies score zero goals. Tonight the Ladies broke through. Katie Brewster (Fox) roofed one at 13:36 on the powerplay to give STU the lead, which they held for the rest of the period. Shots favoured the Mounties 14 to 6 in the second. STU had a few chances in the third on powerplays but nothing got by all-star Meagan Corley-Byrne. The Tommies held the lead until late when MT A was forced to pull their goalie. 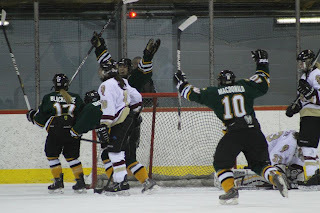 Cassidy McTaggart had an opportune chance to score into an empty net but narrowly missed. On the resulting rush back up the ice Courtney King of the Mounties would bang one by Sharun to tie the game with 54 seconds to play. The Tommies would have a chance with a few seconds left in regulation but were denied. MT A. did take a penalty on the play and were assessed a 2 minute minor at the 20 minute mark of the third. Of course this penalty carried over into overtime. St. Thomas would respond promptly. Playing 4 on 3 in the extra period, Courtney Fox would get by a Mountie penalty killer high in the zone and skate in close enough to fire one past the goalie for the overtime winner. Paige MacDonald picked up the assist on the goal. Tommies WIN. Since Mount Allison forced overtime, it denies the Tommies any chance of advancing to Sunday's championship game, so St. Thomas ends their season with a win. It was an entertaining season of hockey with the Ladies and we look forward to a strong recruiting class and the promise of next year's successes.